I’m all for going green, but what options do you have if you want to go diving into the ocean? It’s not like there’s a bike lane down there, right? Well, there might be soon if Stephane Rousson has anything to do with it. What we have here is the Scubster. The name may be a little awkward or even childlike, but the actual product seems pretty interesting. 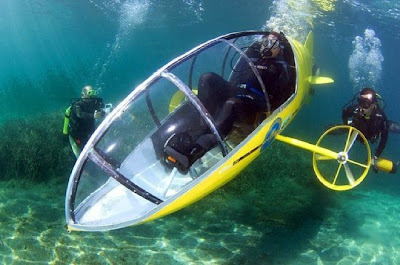 Basically, it’s a pedal-powered submarine that works effectively as an underwater bicycle. You push those pedals around and the twin propellers will push the craft through the water at speeds up to 5mph. Don’t expect to go 20,000 leagues under the sea with this thing, however, as its only rated to go twenty feet below the surface. At that kind of depth, you may as well just swim, but I guess it still makes for a fun afternoon in your private lagoon. The cabin is water-sealed, but your air still comes from a regular tank and face mask. There are no plans for mass production, but you could always give Rousson a ring to have him produce a one-off just for you. That way, you can throw on your favorite racing stripes or Jacques Cousteau-inspired artwork as the paintjob.